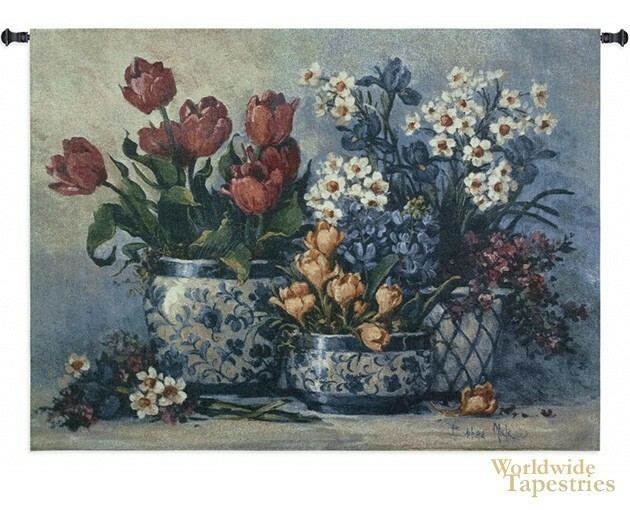 Displaying and showcasing all the beauty of the flowers in a still life setting with gorgeous tones and hues, this floral tapestry "Spring Garden in Blue" has a sense of movement and radiance as the red tulips reach upward as does the other blooms, in an almost impressionistic background that seems to dance in the light. The collection of flowers varying in shape and form, and striking foliage is exceptional in this piece. Look at the play of light in this piece, which is a signature of the masterful works of still life artists. This is a work after the contemporary US artist Bunny Oliver. This floral tapestry "Spring Garden in Blue" is backed with lining and has a tunnel for easy hanging. Note: tapestry rods, where pictured, are not included in the price.